For many industries, fluid control processes are a critical component of the overall manufacturing procedure. In these types of highly volatile environments, sight glass is incredibly important. This is true for the oil, gas, and petrochemical industries more so than it is for any other. Sight glass for oil and gas applications is installed in many tanks, storage and active process tanks alike to allow for constant visual quality inspection. Two similarities found across many oil, gas, and petrochemical production processes are the presence of chemicals and the use of high pressures. Oil, gas, and other petrochemical processes require high pressures to be maintained at certain phases throughout the process. Extreme variations in pressure are also common. Sight glass has the potential to be a weak spot in an otherwise sound system. In order to prevent loss of product or raw materials and, more importantly, to maintain worker safety, high-pressure sight glass should be used. Looking for a quick and easy way to get calculations for your Sight Glass Disc? Try our PSI Calculator. Another factor to consider for petrochemical applications is sight glass’s resistance to corrosive chemicals. Similar to high pressure situations, glass has the potential to be a weak spot for chemical resistance. Luckily, there are types of glass, such as borosilicate, that have a high resistance to acids and other harmful chemicals. The best variety of glass for use with specific sight glass requirements will depend on the distinct aspects of the particular application. Swift Glass fabricates sight glass using a number of different types of glass to ensure it can meet a wide range of needs. BOROFLOAT® glass, manufactured by SCHOTT, is a high quality borosilicate glass. The first borosilicate in the world to be manufactured with the floating method, BOROFLOAT® glass is exceptionally smooth and transparent. More importantly, it has excellent thermal properties and is highly resistant to water, acids, and alkalis. Annular edge glass — Swift Glass took over annular edge glass production after original manufacturer Corning shut down its U.K. plant. Annular edge glass is a product made explicitly for sight glass applications. Molded from multiple layers of BOROFLOAT® glass, annular edge glass features excellent high pressure resistance without losing any transparency. It also has a ground flat and parallel gasketing surface, making it ideal for sealing in a flange. Soda lime glass is a glass variety with reliable overall performance that can be tempered for extra strength. Aside from soda lime glass, BOROFLOAT® glass, annular edge, and all other types of glass that we offer can be tempered to improve strength. Swift Glass offers a wide selection of tempering and chemical strengthening processes. 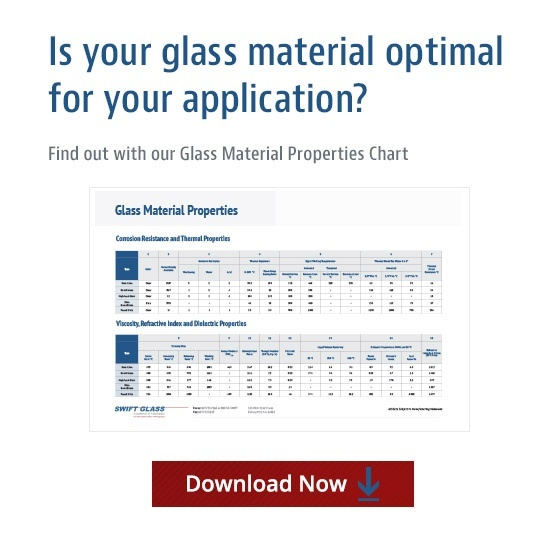 To help in your glass purchasing decisions, Swift Glass offers Selecting & Maintaining Sight Glass, an eBook written specifically to help you select the right sight glass for your application; a Material Properties Chart, and a guide to Glass That Withstands Extreme Environments. Visit our Resource Library to access all of these free guides.